Mary Elke began her farming career growing organic apples and making Mary Elke Apple Juice. Some people in California still know Mary for her apple juice instead of her wine. She still makes 50+ cases of organic apple juice a year. The famous Green's Restaurant in San Francisco serves Mary Elke's Organic Apple Juice. 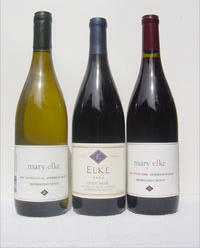 Elke Vineyards are "growers", farming Pinot Noir, Chardonnay, Pinot Gris, and Merlot. Elke Vineyards began more than twenty years ago, and has grown fruit for many, many wineries over the years. The Elke family has been growing Pinot Noir grapes in the Anderson Valley since 1990. Chances are, you have tasted the wine from Elke Vineyards' grapes. Currently Elke grows fruit for Mumm Napa, Roederer Estate, Radio Coteau, Copain Wine Cellars, Londer Vineyards, Au Bon Climate, Mendocino Wine Company, Far Niente, ICI/La Bas, Franciscan, and Breggo Cellars. Every year since 1997 some fruit is reserved for our the Elke wines, namely the Elke Vineyards Blue Diamond Donnelly Creek Anderson Valley Pinot Noir. That wine was made by master winemaker Tom Farella, of Farella Vineyard beginning with its inception, but is crafted by Matt Evans in recent years. Its French Burgundian style has been winning converts for just as long. In addition, there is a Mary Elke Pinot Noir which is a consistently stellar value wine and a Rosé. The wines are sold on the website and thru retail stores.